While nowadays it’s a pretty common choice of food for many people, still millions of Brits have never tried sushi, and believe that the cuisine can simply be described as ‘raw fish’. Research commissioned by popular sushi restaurant YO! Sushi has revealed some of the things that a lot of Brits have somehow so far managed to avoid in their lives. In the detailed study of 2,000 people, it turned out that one third have never had the confidence to eat a meal in a restaurant by themselves, one in four have never pitched a tent, and 22 per cent have never successfully poached an egg. Many of us have never attempted to change a lightbulb, and one third have never had a one night stand. Liverpool, Portsmouth and Norwich came out as the top three UK cities with the biggest sushi virgin populations, while Edinburgh took the lead in food experimentation with 60 per cent having eaten sushi. The study, which was carried out by OnePoll.com, also revealed that the average Brit pops their sushi cherry at the age of 31. That’s good news for me; I still have nine years to go to become the average sushi eater. Hey YO! escape the rain today and warm up with one of our hot dishes. Whether Chicken, Tofu, Prawn or Pumpkin is your thing, we’ve got a Katsu for you? We are proud to have introduced sushi to the UK 21 years ago, when Britain was a nation of sushi virgins, yet to discover its fresh and healthy variety and millions have been loving it ever since. To the 53 per cent of the UK who are still sushi virgins, we want to prove to you that sushi is so much more than just raw fish. We have over 80 delicious dishes at YO!, with actually more non-fish dishes than fish – so we can guarantee there is something for everyone. Tried our new Asian Noodle or Smashed Cucumber Salad ?this summer? Some say, 'they’re the perfect plate for the never ending #heatwave'. ???? 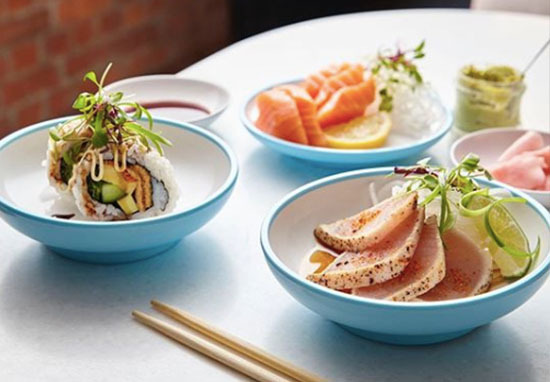 This month, everyone who is still yet to banish the ‘sushi is raw fish’ stigma can lose their L-plates with an exclusive invitation to sample one of 10 sushi dishes at YO! Sushi for the low price of just £1.